In the summer of 2006, Colour-Sargeant Kailash Khebang's platoon was sent to relieve and occupy a police compound in the town of Now Zad in Helmand. He was told to prepare for a forty-eight hour operation. In the end, he and his men were under siege for thirty-one days - one of the longest such sieges in the whole of the Afghan campaign. Kailash Khebang recalls the terrifying and exciting details of those thirty-one days - in which they killed an estimated one hundred Taliban fighters - and intersperses them with the story of his own life as a villager from the Himalayas. He grew up in a place without roads or electricity and didn't see a car until he was fifteen. Kailash's descriptions of Gurkha training and rituals - including how to use the lethal Kukri knife - are eye-opening and fascinating. 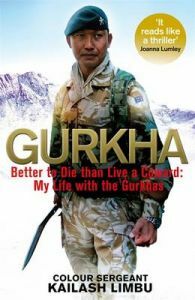 They combine with the story of his time in Helmand to create a unique account of one man's life as a Gurkha. Colour-Sergeant Kailash Khebang is a serving Gurkha soldier and war hero. He has several confirmed Taliban kills to his name, a Mention in Despatches (though his Commanding Officer believes it should have been a Military Cross), two children and a disarming sense of humour. His fondest wish, as long as he can remember, has been to go to war and fight.